Dawoud Bey, Harlem U.S.A. (A Man in Bowler Hat, 1977), 1976, gelatin silver print, 7 x 10 in. The Studio Museum of Harlem was founded in 1968, literally within a few short weeks of the assassinations of Martin Luther King and Robert F. Kennedy. Although its early beginnings were humble, its guiding vision was always grand, leading it to become nothing less than the most important American art institution focused on presenting the work of (mostly American) artists of African descent. Five decades later, its permanent collection consists of about 2,500 works by 700 artists, many of which were acquired in concert with the museum’s ambitious artist-in-residence program. As of this writing, the Studio Museum is engaged in a major expansion and redesign of its main exhibition space at 125th Street, allowing for a year-long tour of much of its collection in an exhibition titled Black Refractions: Highlights from the Studio Museum in Harlem, curated by Connie Choi. Its first stop is at the Museum of the African Diaspora in San Francisco (MOAD) before moving on to five additional American cities. Mickalene Thomas, Panthera, 2002, rhinestones on acrylic on birch panel, 48 × 72 in. recent works by the likes of Kehinde Wiley, Wangeschi Mutu and Mickalene Thomas, but the chance to see earlier works leading up to their later successes represents a special treat that gives us valuable perspective on where and how these artists got their start. 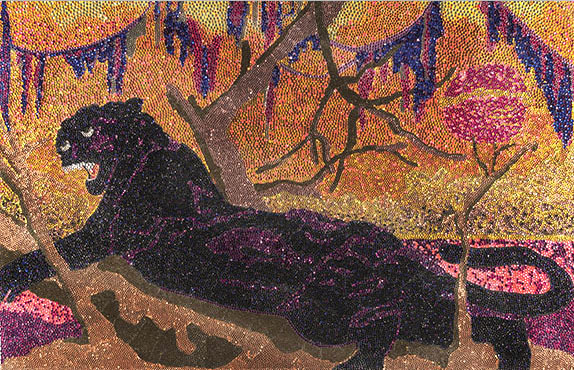 For example, in Thomas’s mixed media work Panthera (2002), we see a tightly designed image of a fearsome big cat reclining in a jungle setting, rendered in sparkling sequins and rhinestones. Obviously, the iconographic reference is to the Black Panthers, but the treatment is steps away from forthright agitprop in favor of something more imaginative, showing a technique that the artist would continue to develop a few years latter in her famous series of full-sized portraits of African American women. 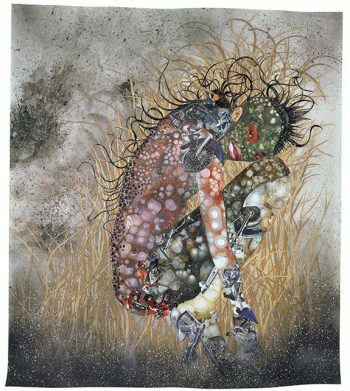 Wangeshi Mutu, Hide 'n' Seek, Kill or Speak, 2004, paint, ink, collage, mixed media on mylar, 48 x 42 in. closely cropped hair declaring a purposeful contrast to the tentacles of cut dreadlocks that surround the figure, all saying something about the sacrifices that are made for conformity and putative success. Mutu’s 2004 collage, Hide ‘n Seek, Kill ‘n Speak, is another standout. Executed with (and on) sheets of loosely painted mylar, it shows a crouching woman with elaborate body markings hiding in tall grass looking back at a viewer who may feel taunted by her facial expression. There are some good photographs to be seen in Black Refractions. A trio of prints by James Van Der Zee reach back to the Harlem Renaissance of the 1920s, showing off his studio portrait practice and hinting at the fact that said studio was an important meeting place for artists and writers at that time. 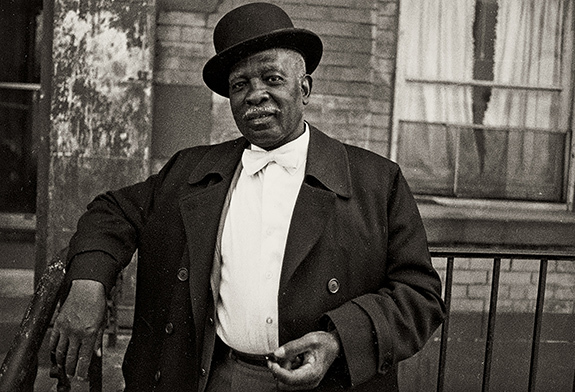 Another trio of photos by Dawoud Bey from the early 1970s show tonally elegant scenes of Harlem street life, with an eye toward oddball characters who made their home in or near the Harlem neighborhood. Other photographic works by Lorna Simpson, Carrie Mae Weems, Lyle Ashton Harris and Juliana Huxtable are informed by semiotic and performative approaches to photography that emerged in the 1980s. 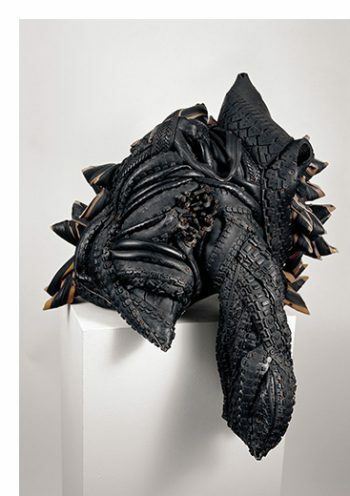 Chakaia Booke, Repugnant Rapunzel (Let Down Your Hair), 1995, rubber tires and metal, 33 × 25 × 22 in. accomplished portrait of a slender woman with a teased-out afro set against a gold leaf background. It is also not so in the case in works by Fred Wilson and Glenn Ligon, who work with language elements in a more conceptual way. But in other works such as early Untitled paintings from Kerry James Marshall and Mark Bradford, or a relatively recent work by Henry Taylor, tactility is very much in the tangible foreground, as is the case in sculptural works by Chakaia Booker and Betye Saar. Abstract paintings by Stanley Whitney and Norman Lewis also support this point. There is another interesting subtext to this exhibition worth noting, and it pertains to the likely evolution of MOAD, which was founded in 2005 as a strictly presenting institution. The message is that MOAD should follow in the wake of the Studio Museum and become a collecting institution. That, of course would require a significant expansion of institutional capacity and maybe even an expansion of its base of operation. The long-term advantages of pursuing such a course cannot be underestimated. Black Refractions should convince even the most skeptical observer of this fact, art historical hindsight being what it is. 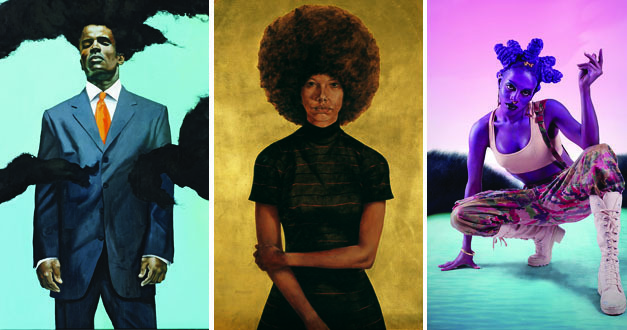 “Black Refractions: Highlights from the Studio Museum in Harlem” @ Museum of the African Diaspora (MOAD) through April 14, 2019. The exhibition travels to Gibbes Museum of Art, Kalamazoo Institute of Arts; Smith College Museum of Art; Frye Art Museum; and Utah Museum of Fine Arts.